You are here: Home / Book Reviews / The Time Between Dreams: How to Navigate Uncertainty in Your Life And Work. 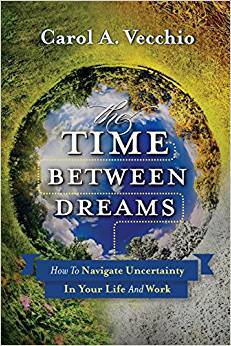 I read this book after hearing Carol Vechio present an all-day workshop for Maine Career Development Association on how to navigate uncertainty using her model of transitions. The metaphor of looking at our ability to navigate uncertainty using the four seasons is interesting. We really do have stages in our career development that feel like “winter”… a bit lost and uncertain about the future, all the way through “summer” when things really seem to be going well. I enjoyed the view of the four seasons as they translated to the career development process but mostly found value in the exercises at the end of the book. This is a “thinker” book and helps people reframe their situation and why they feel it is so hard to navigate uncertainty in their career transitions. But most importantly that what they are going through is normal. If you are having to navigate uncertainty in your career transitions, this is a good book for you.